Click the stars to rate how good you think DWCS 1 was. 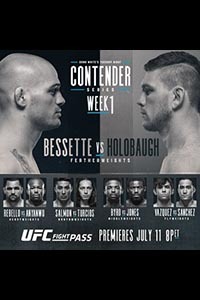 • Matt Bessette vs. Kurt Holobaugh: Kurt Holobraugh def. Matt Bessette via knockout (punch) at 2:59 of Round 1. • Greg Rebello vs. Azunna Anyanwu: Azunna Anyanwu def. Greg Rebello via knockout (punches) at 3:04 of Round 2. • Boston Salmon vs. Ricky Turcios: Boston Salmon def. Ricky Turcios via unanimous decision (30-27, 30-27, 29-28). • Charles Byrd vs. Jamie Pickett: Charles Byrd def. Jamie Pickett via submission (arm-triangle choke) at 4:55 of Round 1.